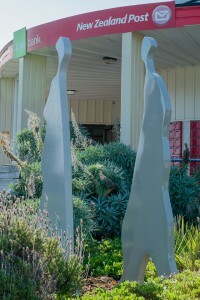 Two steel figures pass in an urban ballet outside the Oneroa Post Office on Waiheke Island. They are part of the Sculpt Oneroa show. Oneroa village on Waiheke Island is to host Sculpt Oneroa, an outdoor sculpture show timed to coincide with the bi-annual Sculpture on the Gulf exhibition. The idea is to exhibit work of local sculptors, many of whom have previously exhibited at Sculpture on the Gulf and Toi Gallery including: Chris Bailey, Leon van den Eijkel, Lyndal Jefferies Sally Smith, Toi-Te-Rangiuaia and myself. A total of 17 works will be scattered throughout the village during the period 18th January to 18th February 2013. The work I am showing is Pas de Deux (with hoodies) which was previously exhibited at Sculpture OnShore 2010. The work comprises two figures in painted steel with overall dimensions of 2,000×1,200×1,200mm. The work is for sale – $10,000 (inc. GST).